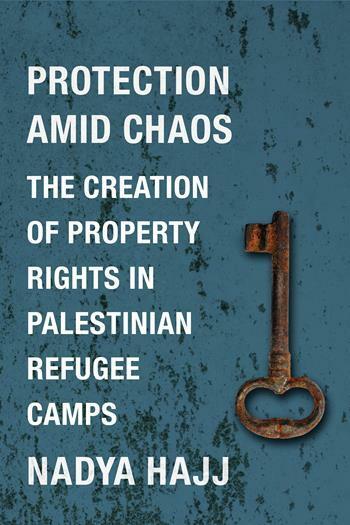 Nadya Hajj will join POMEPS to discuss her new book, Protection Amid Chaos: The Creation of Property Rights in Palestinian Refugee Camps (Columbia University Press, 2016) on Tuesday, January 23, 2018 at 12:00pm. The product of two hundred of interviews with refugees, this book focuses on Palestinians living in refugee camps in Lebanon and Jordan as they develop binding claims on assets and resources in challenging political and economic spaces. Hajj is an assistant professor of in the Peace and Justice Studies Department at Wellesley College. Her research focuses on the origins of institutions and the formation of property rights with respect to private assets. The discussion will be moderated by POMEPS director Marc Lynch of George Washington University, and there will be time reserved for audience questions. Limited copies of the book will be available for students. There will be a light lunch.